So much talk about strategy and so little understanding of what it is, what it involves, and the difference between a good strategy and a bad strategy. You can call me a little touchy (or a lot touchy) when it comes to strategy and strategy making. I encountered strategy only after being heavily involved in the operational stuff – getting my hands dirty making the ‘trains run on time’. Being new to strategy I made the time and put in the effort (lots of it) to study strategy and strategy making. I do wish more people would do the same then we would not have tons of rubbish being written on strategy by people. Yes, this paragraph is a rant. Now lets move forward and doing something constructive: learn the difference between good strategy and bad strategy. If you don’t care then I suggest you stop reading right now. I am in total agreement with the first sentence of Paul’s statement. What he is saying is that there is no such thing as a homogenous customer experience. The customer experience that you design and deliver has to be in alignment with the value proposition that you have communicated to your customers. 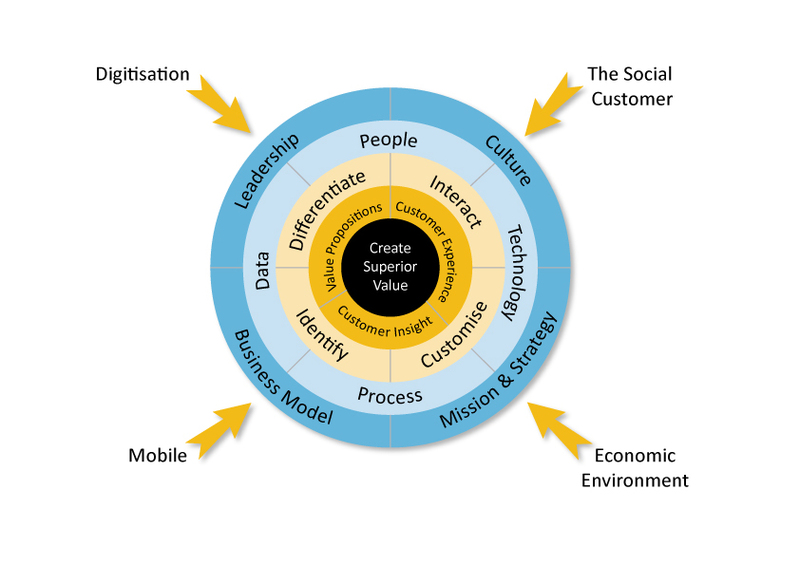 This is why, in the model below which I developed and use, the Value Proposition feeds into the Customer Experience; the third pillar is Customer Insight – it feeds the creation/refinement of the Value Proposition and the Customer Experience. The sequence goes like this. Generate insight into customers (Customer Insight). Use this insight to craft a Value Proposition that a customer/market segment finds attractive enough to sign-up for. And deliver a Customer Experience that is in alignment with the promise (implicit, explicit) made through the Value Proposition. Do that and you have happy, even delighted, customers – which is why both USAA and CostCo can score high marks even though the Value Propositions and associated Customer Experience is radically different. So far Paul and I are in agreement. Does anyone understand what a real strategy is? He writes “A strategy should provide a vision for the kind of experience to deliver, derived from a core value proposition inherent in a company strategy and key attributes of the brand promise that are most meaningful to customers……” Hello, anyone at home? A vision is a vision – it is picture of the ‘future’ that you want to bring about. So, I might have a vision of living in Rio and spending my days surrounded by Brazilian beauties, soaking up the sunshine, waited hand and foot, swimming in clear blue waters…. A vision is not a strategy and a strategy does not include a vision. He continues with “The strategy also needs to articulate the company’s aim for how good the experience should be…does the firm seek to be the best in its own industry or across all industries, or is it merely trying to maintain parity with other firms? This will guide the kind of resources that the firm may need to dedicate to reaching this objective.” Now that sounds awfully like objective setting to me. Maybe I am a little simple and being simple, in my world objectives are objectives and they in turn drive the formulation of the strategy. Continuing with my analogy, if my objective is to be waited hand and foot on the beautiful beaches of Rio, all my needs catered for, then I have to formulate a strategy that allows me to get hold of the money/power that I need to realise my objective. Notice that the objective comes first. Continuing with my Brazilian (Rio) analogy, let me ask the question: “Why do I need a strategy?” Perhaps the challenge is that I live in the UK, I am penniless and I do not have a passport. Now if that is so then I need a strategy that addresses these challenges – the challenges that prevent me from being in Rio surrounded by Brazilian beauties and being waited on hand and foot. Let’s continue and explore this further. What are we talking about when we talk about strategy? The issue at hand is that ‘strategy’ has becoming a meaningless phrase bandied about by all of us (including myself) to mean anything that we want it to mean. In my simplest way of thinking, one needs a strategy in order to outwit intelligent opponents and/or address an important challenge which if not faced ‘promises’ an exit from the game of business. Does that sound like Kodak to you? Which is why monopolists who control valuable resources, that people cannot easily do without, do not need to formulate a strategy: they just have to make sure that they continue to be the monopoly supplier. The components that feed into and drive the strategy making process include: Challenge (the pain that requires a strategy to be developed); Vision (the future state that you wish to create / bring about); Objectives (the specific, measurable, outcomes that you want); Resources (what resources are ready at hand); and Constraints (these can take many forms political, legal, technological, values that cannot be sacrificed….). If you want a deeper understanding of strategy and strategy making then read this post. What are the hallmarks of a bad strategy? Fluff/ Fluff is gibberish that masquerades as strategic concepts and arguments . It uses “Sunday” words (words that are abstruse / inflated) and esoteric (I call them ambiguous, unnecessarily complex) concepts that create the illusion of high-level thinking. Failure to face the challenge. Bad strategy fails to recognise and clearly set-out the challenge. Richard points out that if you fail to clearly set-out the challenge (in concrete terms) one cannot evaluate a strategy or improve it. Mistaking goals for strategy. Richard says that many strategies are just statements of desire (the vision) rather than plans for overcoming obstacles and addressing the challenge. Bad strategic objectives. Strategic objectives are bad when they fail to address critical issues or when they are impracticable. I will go into these in more detail in forthcoming posts. In the meantime I wish to leave you with the following statement by Richard Rumelt which, in my view, goes to the heart of the matter: “All too much of what is put forward as strategy is not. The basic problem is confusion between strategy and strategic goals.” Do you think Paul Hagen has fallen into the same trap? I agree that there is a lot of talk about strategy some good and much that is bad and, generally, nonsense. I think Paul Hagen’s definition is ……..I just re-read it and still don’t get the core of what he is on about. When I was studying I was taught that strategy is a set of plans and methods that marshal resources in such way as to achieve a specific goal or objective. Pretty straightforward, right? Now, Paul seems to be trying to do that but, boy!, does he make it hard to understand. As you say, way too much fluff. One point on what you said about monopolists. You said that they do not need to formulate a strategy. I disagree. Surely their strategy will be to do everything they can to maintain their monopoly position so that they can continue to extract ‘rent’ from that position? What can I say I agree with you in one sense and not in another sense. Let me see if I can explain that. The East India Company was a monopolist – it had a monopoly over the Indian subcontinent along with other territories. Once the East India Company had this monopoly the Board of Directors put ‘hungry ambitious men’ in charge, on the ground, to exploit the wealth of the Indian subcontinent. That was the ‘strategy’ if we want to call it that. Everything was going excellently and the shareholder of the East India Company along wiht Directors and key people on the ground got wealthy – very wealthy. Then trouble struck – the Indians started rebelling, English people got killed…. Now the British Government got involved and they were threatening to take over that monopoly. This is when the East India Company top brass started developing a strategy: to buy off key ministers in the British Government and quell the resistance on the ground in India. Ultimately, the strategy of repression / killing / cruelty on the ground undid their work in buying Government ministers and the East India Company lost its monopoly – it passed to the Crown. So what I am saying? Sometimes you have a ‘strategy’ and it just came about be default – without any serious consideration, work, effort. This was the case with the East India Company – there was a ‘old boys network’ between the top brass at the East India Company and government ministers – some of whom were very important shareholders which is how the company got its charter. Sometimes you actually have to make the conscious effort of formulating a strategy because you have a challenge – a time bomb is ticking. In my speaking I am referring to the latter only as ‘strategy’. Great post, very rational and simple way to define strategy and strategy formulation. Needed to be said. I also agree on the short part where you talk about the process for defining and delivering value. Research finds what constitutes customer value in the first place, marketing makes that the value promise and that value is delivered in the experience. I’m just a bit confused with the last sentence where you go on saying that USAA and Costco are doing great because of a disparity in promised value and delivered experience. I re-read of few times, something I can’t get my head around. First of all I thank you for dropping by and adding your voice to the conversation. Then they orchestrate the stuff that needs to be orchestrated (in particular the value chain) to deliver a Customer Experience that delivers on the bargain struck in the Value Proposition. How long would CostCo survive if it priced its products as it does today and then put its stores in prime retail locations in the centre of the city, offered valet parking, a personal shopper awaited at the entrance and did all of your shopping for you? I hope that clears up the confusion. I will be writing a more detailed post to make all of this clear as many people are going about Customer Experience in a misguided way – that is how it occurs to me. Hi Maz, totally agree, that’s how I also explain it should work and what my CEM Framework is based on. Was just confused by the phrasing for a while. By “which is why both USAA and CostCo can score high marks even though the Value Propositions and associated Customer Experience is radically different.” I thought you meant that both these companies have a customer experience radically different that the value proposition, which was the very opposite of what you said earlier. But I can read now you meant the value propositions is radically different *between the two companies*. Maybe just the word “the”. Maybe I was tired. That said just one last quick note, the value delivered must be in line with the value promise, but the customer experience is wider than that and includes interactions which are not necessarily part of the brand image or value promise. Usually the brand’s value proposition has to be narrow. One thing. Easy to remember. For example if Costco promises low cost, they deliver low cost. That’s basic but fundamental. But that value proposition says nothing about ,for example, the ease of finding a parking space. Yet, it’s part of the customer experience. So while the relation between value promise and value delivered is the core of a company, there are still a lot other points to consider to manage the customer experience in a holistic manner. Now I could go on about the concept of “differentiated brand promise” and about how that promise should transpire through any interaction (or create a promise per channel) but I should let you write part 2 of this article. I look forward to it. If a strategy is something that helps you deliver an objective then why do we use the word “strategic” for something that is big, expensive and so questionable and that nobody can get their mind around it? I believe you got “fluff” straight away! Part 2 will be on its way soon. what is the overall conclusion of Rumelt.